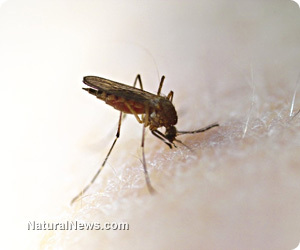 (NaturalNews) The International Federation of Red Cross & Red Crescent Societies (IFRC), the parent organization of the more widely known American Red Cross, is currently engaged in a massive cover-up of a simple, non-toxic cure for malaria. A recent field trial conducted with a team of Red Cross humanitarian workers in Uganda found that 100 percent of malaria victims treated with a simple solution mixed in water were healed within 24 to 48 hours -- but now the Red Cross is disassociating from the findings, claiming the trial never even happened. A leaked documentary film recently posted to YouTube shows a team of experts heading to the small Ugandan village of Iganga, where a joint trial evaluating the effects of sodium chlorite activated to produce chlorine dioxide, a solution more popularly known as MMS, took place back in December with the help of Ugandan Red Cross workers. The film, which features a number of Red Cross officials and other workers administering the solution to local villagers, details the progress of the trial from start to finish, highlighting its important findings. Narrated by Klaas Proesmans, CEO of the Water Reference Center, a group affiliated with the Red Cross, the film demonstrates how MMS is an effective treatment and cure for malaria, and how it has the potential to improve the quality of life for millions of people living in Africa and elsewhere by preventing millions of needless deaths. Specifically, the film highlights how every single villager given MMS as part of the field trial was cleared of malaria in two days or less, an astounding success rate that is worthy of further inquiry. "Every other day we had around 150 to maybe 200 patients," participate in the study, states Proesmans in the film. "In total, we identified 154 malaria positive patients, together with the local health authorities or the doctors. All of them were treated. All of them were, between 24 hours and 48 hours, malaria negative ... without any side effects." The film also features many others who divulge the benefits of MMS as observed during the study, focusing as well on how existing water treatment protocols involving sodium chlorite are already helping local villagers avoid or become cured of malaria. The obvious takeaway from the film, in other words, is that MMS holds incredible potential for curing malaria quickly, inexpensively, and safely, something that any humanitarian-minded individual or organization, including the Red Cross, should welcome with open arms. Is the Red Cross as a humanitarian organization really all about helping people? But rather than acknowledge these powerful findings and look into them further, the Red Cross dragged its feet in analyzing the data and proceeded with business as usual, without any further inquiry into the potential benefits of MMS. When pressed, the organization later denied having any affiliation with the research, implying that no trial was ever even conducted. Now that actual footage of the trial has been leaked, however, the Red Cross has some serious explaining to do. "To date, the Red Cross has done nothing with the results, except, of course ... to hide the truth and tell lies," says Leo Koehof, an MMS specialist who was involved with producing the film. "This is equivalent to genocide," he adds, noting that even Klaas Proesmans, who was featured in the film as an apparent proponent of MMS, has backed off and disassociated himself from the findings. Proesmans and the Red Cross apparently take their cues from the much larger medical-industrial complex and its "humanitarian" affiliates, which are apparently disinterested in actually finding a cure for malaria. If they really were all about saving lives as they claim, then they would take seriously the findings of this buried field trial and conduct further research on MMS. But their actions prove that they are more interested in towing the status quo rather than actually helping people.